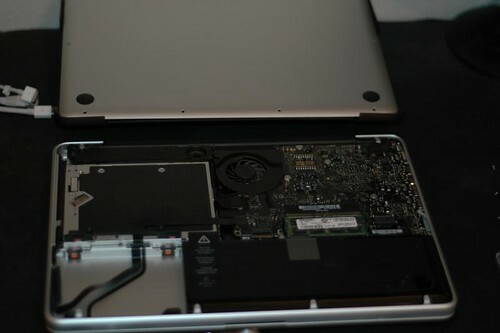 Upgrading the hard disk in a uni-body aluminium MacBook Pro is really very easy. First, find a suitable hard disk, I’ve opted for the Samsung HM500II (500GB) SATAII 2.5″. Personally I don’t think solid state hard disks are at a point where the balance between capacity and cost makes sense. Now before you start, take a full time machine backup – this really is the simplest way to move your current system to the new hard disk. You won’t need to fiddle about reinstalling and configuring things. When taking your backup, check to make sure you haven’t excluded any folders from the backup. I normally have my “Downloads” folder excluded from the normal time machine backups. 1. Open up the bottom of the laptop – my desk always has an antistatic work mat on it, but take the regular precautions! 2. Unscrew the little holder pictured below and lift it out. 3. Lift out the hard disk (which I’ve already done) and carefully disconnect the connectors. 4. 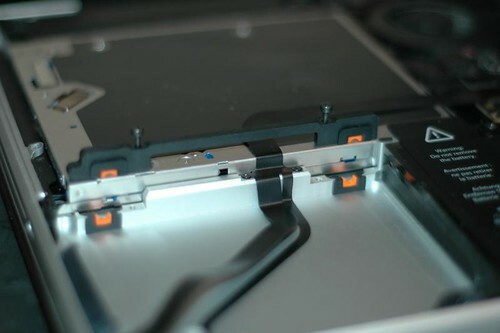 Remove the screws from the side of the hard disk, you’ll need to put these on your new disk. You will need a torx (Star) 5mm screwdriver for this. 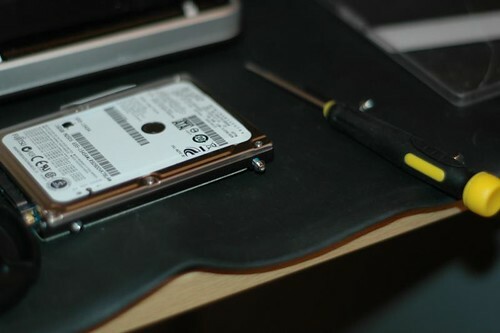 If you don’t have a 5mm torx, you could use a pair of pliers to carefully unscrew them and hand tighten them on the new drive. Invest in a set of torx screwdrivers, they are worth it, and handy. 6. Boot your system from your install DVD. Using the “Disk Utility” create a new partition, then use the “Restore from backup” option on the “Utilities” menu. Connect your time machine backup drive and follow the onscreen instructions. it took roughly 1.5 hours to restore my 120Gb system. I did run into a small problem after the restore, which is apparently quite common. “Quick look” stopped working, this is where you select a file and press the space bar to get an instant preview of the contents. I found a fix, and its documented here. As always, please feel free to post a comment, or talk to me on twitter.